In human nutritional science progress has always depended strongly on analytical measurements for establishing relationships between diet and health. This field has undergone significant changes as a result of the development of NMR and mass spectrometry methods for large scale detection, identification and quantification of metabolites in body fluids. This has allowed systematic studies of the metabolic fingerprints that biological processes leave behind, and has become the research field of metabolomics. 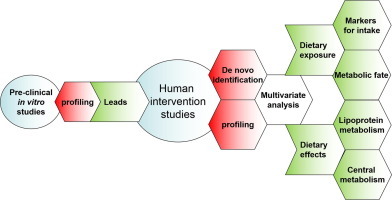 As a metabolic profiling technique, NMR is at its best when its unbiased nature, linearity and reproducibility are exploited in well-controlled nutritional intervention and cross-sectional population screening studies. Although its sensitivity is less good than that of mass spectrometry, NMR has maintained a strong position in metabolomics through implementation of standardisation protocols, hyphenation with mass spectrometry and chromatographic techniques, accurate quantification and spectral deconvolution approaches, and high-throughput automation. Thus, NMR-based metabolomics has contributed uniquely to new insights into dietary exposure, in particular by unravelling the metabolic fates of phytochemicals and the discovery of dietary intake markers. NMR profiling has also contributed to the understanding of the subtle effects of diet on central metabolism and lipoprotein metabolism. In order to hold its ground in nutritional metabolomics, NMR will need to step up its performance in sensitivity and resolution; the most promising routes forward are the analytical use of dynamic nuclear polarisation and developments in microcoil construction and automated fractionation. [NMR paper] Genetic analysis of 16 NMR-lipoprotein fractions in humans, the GOLDN study.